I have some yarn that I want to use for a project but I don’t know how much I have. I don’t want to run out. Please help. If you don’t have the original packaging to know what the yards per pound is of the yarn in question. You can easily figure this out with a McMorran Yarn Balance and a scale. This answer comes to you from Woven Scarves, by Jane Patrick and Stephanie Flynn Sokolov. Step 1. Balance the pin of the balance arm in the slots on the sides of the balance. Step 2. Place a length of yarn in the notch of the arm. Step 3. Cut the yarn little by little until the arm is balanced. Step 4. Measure this length of yarn on a ruler. Step 5. 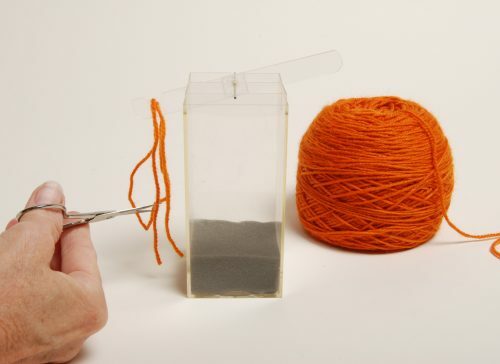 Weigh the ball of yarn on a scale to find out the total weight of the yarn you have. Step 6. To know if you have enough yarn, you’ll need to do a little math. First multiply 4 x 1,500 = 6,000. Then divide this number by 16 to give the total amount of yarn: 6,000/16 = 375 yards.